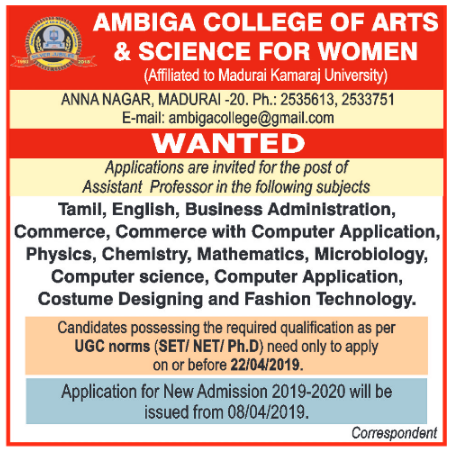 Ambiga College of Arts and Science for Women, Madurai, has advertised in DINAMALAR newspaper for recruitment of Assistant Professors jobs vacancies. Interested and eligible job aspirants are requested to apply on or before 22nd April 2019. Check out further more details below. College Profile: Ambiga College of Arts and Science for Women was founded by DR.S.Solaimalai, a great philanthropist and strict disciplinarian with a vision and favour for the empowerment of women. The college has completed 21 years of committed service towards higher education for women.The college started functioning in 1994 with the sole aim of uplifting the down trodden and weaker section who were predominant in this area at that time. Much importance was given to educate the women population mostly poor and ignored in the field of education and social life. How to Apply: Interested and eligible candidates are requested to send CV along with all copies of certificates / testimonials and recent PP size photos to postal address or email address provided here.